William went to Cambridge, married my grandmother, before leaving the family home while his family were still very young. I discovered that he went to Trinity College, Cambridge. As a result of this, I wrote to the Assistant Archivist and Manuscript Cataloguer at Trinity College Library (who had helped me on the Clare branch) to see if he could provide any more information. He told me that William attended the City of London School, and was admitted at Trinity as a pensioner (a normal undergraduate) on 30 September 1905. He passed Part I of the Economics Tripos examination in 1907 and Part I of the Special Examination in Law in 1908. He had a special dispensation in respect of the former ('Excused part General exam.') and passed the latter in the second class. He obtained his BA in 1908. He also told me that he was elected a member of Trinity Boat Club on 14 October 1905, and that his name appears in more than one team list in the Club's minute book. The minute book also contains an account of the Lent Bumps 1908. He told me that Hill and his team-mates rowed in the fourth boat, which went up four places. He was elected a member of the Magpie and Stump (the college debating society) on 1 March 1907, but it does not appear that he took part in any debates. In answer to a speculative question I put as to whether William’s father went to Cambridge, he said there were no William Hills in the Alumni Cantabrigienses (the standard printed list of Cambridge alumni) who might be identified with the father. But, "since he was involved in journalism from boyhood, it seems quite likely that his education was not prolonged beyond school." 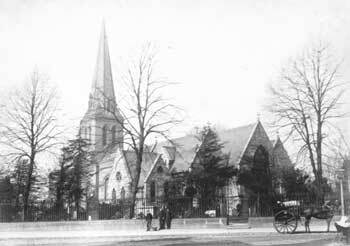 William married Alma Georgina Annie Haskins, or Georgie as she was always known, at St Leonards Church, Streatham (photo left) on 28th January 1911 when she was 4 months pregnant with Peggy. To allay any questions over Peggy's birth, the daughters were always told their parents married in 1910. A couple of months after their wedding, on the 1911 census, William & Georgie are living at 30 Badminton Road, Wandsworth in a five room house. William is described as a journalist and has a B.A. 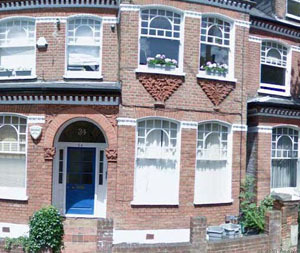 The last two daughters were born at 34 Crockerton Road, Wandsworth, London. A current Google street map picture is shown on the right. From what my mother told me, her father had DIED when she was very young and she didn’t remember him. She and her sisters were brought up by their mother, Georgie. Whether that was what her mother told her or whether she actually knew the truth, but was too embarrassed to tell anyone, we will never know. The truth was very different and still too sensitive to be told and still covered by The Family Skeleton Secrets Act. At some point William began to include a middle name for himself and became William Wimbledon Hill (he had been born there). He was the author of the book, which is listed on Amazon, "One Hundred Years of Boat Racing - The official souvenier of the Oxford and Cambridge Boat Race 1829 - 1929." A copy was auctioned in 2010 with added description - "portraits of the crews, history of the race etc. Excellent decorative colour wrappers. Good condition. rare." I don't know how much it sold for.